Inform SDL that an application must be unregistered or put into the NONE HMI state. Provide the possibility for the user to exit any of the registered applications. Track if an application is active or running in the background, and complies with the driver distraction rules of the system. Track that the transport type that corresponds to the application running. For example, navigation applications are not allowed to be run over a bluetooth connection. Ignore all SDL RPC's related to an application that are defined as prohibited for a specific transport type. 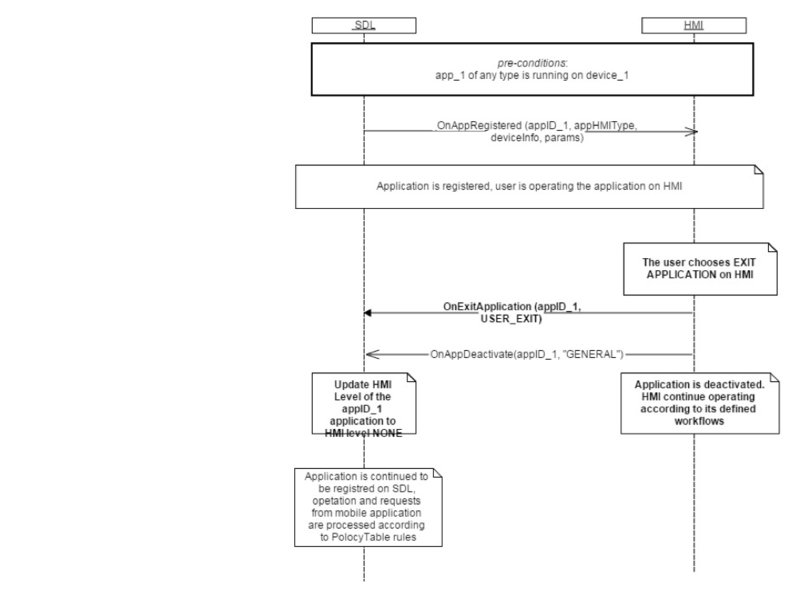 Send OnExitApplication notification to SDL if an application conflicts with any of the rules above (i.e. Users requests to exit, driver distraction rules violated, or navigation app connected over bluetooth). The HMI may switch layouts or views according to the workflow after deactivation of an application. Information about the application (name, appID, etc) is provided by SDL via BC.UpdateAppList or BC.OnAppRegistered. SDL ignores all invalid notifications which come from the HMI (Invalid JSON, invalid data types/bounds, etc).